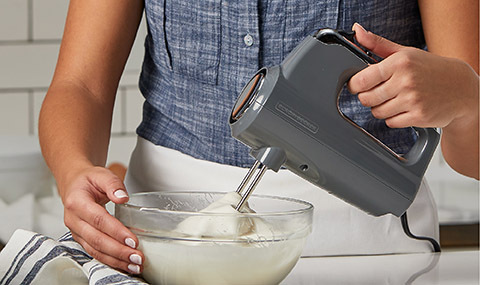 Helix Performance™ Premium Hand Mixer, Gray is rated 4.5 out of 5 by 56. Rated 1 out of 5 by deb1275 from too frustrating I was so excited to get this, and I love the feel of the mixer and that you just push the button to increase the speed. I am not a fan of digital mixers. However, the frustration of trying to get the beaters inserted every time, has caused me to say I hate this. I got them in just once and they worked great, but every time after they won't go in. I don't know if its me, or what but I bake for fun, and not frustration so will be giving this away and very sorry to say so.. I do love the feel of it in my hand. Rated 4 out of 5 by Kaylaann from great update from my old one I used to have an older version and this whips up my mash potatoes in half the time! Rated 5 out of 5 by sunnybo from Great speed Love the Black and Decker Helix Hand mixer. Love that it comes with different mixer pieces for different foods you make. I love the speed. It's great. Mixes very well and through. I love that it has a storage cover. I put all my mixer pieces and also cord from mixer in and it's all covered. Great for lack of storage in my home. Can keep all pieces together. No losing them. Love that! I received a sample product. All words expressed are my own. Rated 5 out of 5 by cris4 from Highly Efficient! This mixer packs a punch! It is such a sleek and modern design that I am in love with it. It comes with its own 'storage' so you will not lose a single piece. My other brand did not have that and I always could not find the beaters anywhere. So this is handy when you are in a rush to whip up a quick recipe. The beaters are so unique I had never seen any like that and now I am addicted. It really takes the lumps out when I'm mixing ingredients. Rated 5 out of 5 by jptheprez from Black & Decker Helix Premium Hand Mixer I've used the product over the course of the last 2 weeks. 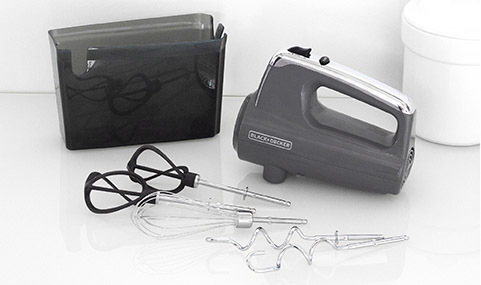 The speed is awesome and more than needed for any given task.This mixer comes with a wire whisk for use on eggs which was a pleasant addition. For me the best feature is the case , which when the Mixer is not use , all the attachments fit into the bottom of the snap on case , which the Mixer, snaps onto , easy for storage and keeping everything together for easy storage and retrieval. Rated 5 out of 5 by Raider47 from Works great I’ve had this mixer for a few weeks now and I love the design. I really like the storage compartment that attaches right to the mixer to hold all of the different tools. The helix design beaters are great, they mix evenly and break up clumps well. I also really like that it comes with a little whisk that I can use to mix eggs and liquids. My daughter loves to bake cakes but my stand mixer is a bit large for her to handle so she uses this mixer now and it is much simpler for her. Rated 5 out of 5 by Pruess1988 from Awesome Mixer! I received this product to try from the first look program, and I must say it's a pleasant surprise! Not noisy, and runs smooth, mixing everything thoroughly. A must have for those who love to spend time in the kitchen. Rated 5 out of 5 by Sunny62 from Awesome Hand Mixer! I received this mixer as a sample to try out and give my honest opinion. I love this mixer! The beaters are not your typical metal type beaters. They are nylon coated so no more scratching my glass bowls. It has 5 speeds and a turbo boost! Great for making brownies like we did. The storage container that snaps onto the bottom of the mixer is great. No more looking for the attachments. 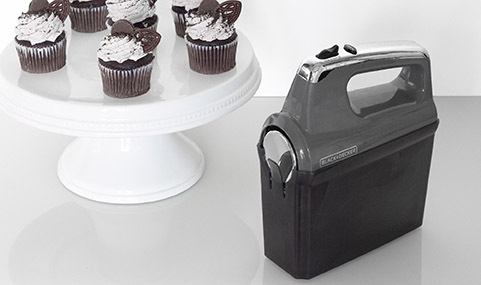 I love to bake and this sure will make it a lot easier and faster! It is lightweight and quiet too! Rated 5 out of 5 by Taschia from Works great The Black and Decker - Helix Performance™ Premium Hand Mixer works great. I have arthritis and it really helps when I'm baking. It comes with several sets of attachments, mixers, a whisk, etc. They all work very well and make my mixing time enjoyable. Rated 4 out of 5 by iocampo from Awesome I enjoyed using this mixer when I was making some cupcakes recently. The whisks were easy to remove and easy to clean. There were no issues when I used it and the storage caddy was very useful. Rated 4 out of 5 by Fran from Nice product I got this for free to try it out and I really like it. It’s light weight which is nice. Just not yo crazy about the blenders being plastic. I mashed potatoes with the blenders and it wasn’t that great at mashing them up and they tended to fly out of the bowl. On the plus side it was great at blending up cake batter. Rated 5 out of 5 by Adrienne34 from great performance.. I just got around to using my new black and decker-premium hand mixer. I was very amazed on how great the mixer worked. I was looking to purchase a new hand mixer because the one I had was very old. I'm very impressed with this product . I've mixed a few things so far a cake and homemade brownies. I'm really looking forward to making lots more. Rated 4 out of 5 by Srm273 from Easy to use and store I love to bake and was so excited to try this product. I really like that it has a storage box for the attachments because it saves space in my kitchen and keeps everything together. The helix beaters are coated and protect my metal bowls from being scratched up. They also seem to blend up more ingredients at once, however, when making cookie dough they tend to clog up and hold the thick ingredients such as creamed butter and sugare inside instead of spinning them out and around. Overall, The product does a great job and has a lot of power for its small size. The dough hooks and whisk attachments are also a great bonus and makes baking a sinch since I have the tools I need all in one appliance. Rated 5 out of 5 by Justme0419 from Packs a punch! For being a handheld mixer, this product is surprisingly powerful and efficient! I had the opportunity to put it through it's paces today when I made my grandmother's world famous peanut butter chocolate chip cookies. The batter is incredibly stiff, and to be honest gives me a sore shoulder to mix by hand. I love how small and compact it is. It doesn't take up my whole counter, and still really delivers when I need it to. 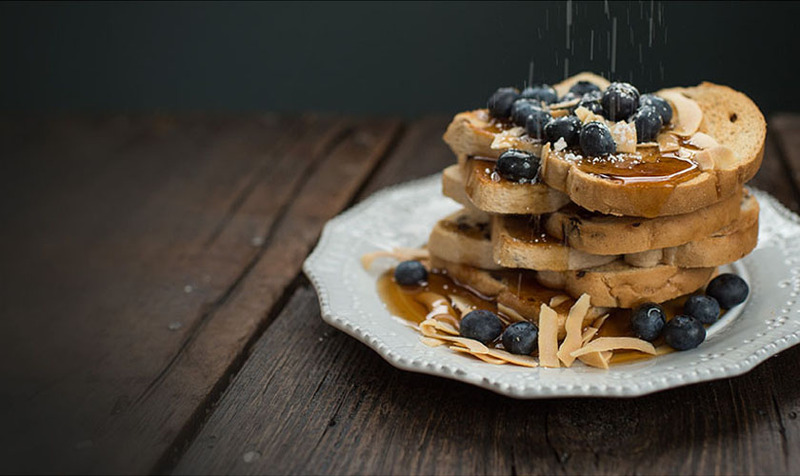 It's also great for smaller tasks like pancake mix, scrambled eggs, homemade whipped cream etc. It's very versatile. Another thing I like it the selection of beaters that come with it. Different recipes call for different ways of mixing and with the Helix, I have everything I need all in one product. I'd highly recommend this mixer! Rated 5 out of 5 by jennzenn from Making my life easier!! I received this mixer about a month ago and I can't tell you how much I love this thing! With the beaters Helix design and a bonus dough mixer and a whisk I don't need any huge equipment all I need is this mixer. With the storage container it keeps the cord and all the attachments together! Where have you been all my life! Rated 5 out of 5 by Hopers34 from I love it! The Black and Decker Helix Performance Premium Hand Mixer is so much better than your typical hand mixer. I decided to make a pound cake and take the new mixer for a spin, rather than using the counter top mixer. I was a little nervous, because I typically end up slinging batter from one end of the kitchen to the other, when I use my run-of-the mill hand mixer. I attached the helix beater attachments, placed them in the bowl to cream my butter and sugar, and just prepared myself for the mess. Only, there was no mess! I turned the mixer to the lowest setting to get a feel for things. I turned it up a notch. Still good. One more notch, and it creamed my butter and sugar to perfection. I was able to mix the rest of my batter with no problem. Well, except for when I felt the need to test the turbo button. Even then, there was WAY less spatter than my old mixer! My only issue is the attachable storage container is a bit bulky and doesn't stay snapped on very well, but who cares! This mixer is amazing! Rated 4 out of 5 by Darbie from I am in love I received this mixer free to try out. I have to say it is my favorite mixer ever. Great and easy to handle. The speed settings are easy to reach while using and there are plenty of setting. The beaters are easy to put in and take out and especially easy to clean. the fact that this mixer mixes in 2 directions instead of one means things are mixed easier and faster. Have not used the bread hooks yet but the whisk sure got some egg whites stiff quickly. the fact that I could rest the mixer with the heel and bowl rest was wonderful at preventing messes when using. Rated 5 out of 5 by mmille16 from Awesome hand mixer! This hand mixer is very easy to use. I love that isso lightweight and it does not take up much storage space. It comes wih detachable mixing pieces that you can easily store and wash. I love that it has a variation of speeds on it. I love baking in the kitchen and having this mixer has made it so much easier for me to bake now. Rated 4 out of 5 by carley1111 from Fast And Smooth I love the power that this mixer has and the different blades that makes my dishes so smooth for my family doesn't like lumps in their mash potatoes and the design of the helix blades cut right though the potatoes making them smooth with no lumps. It is very lightweight making it comfortable to use. I like the size for it doesn't take up much space making it easy for storage plus its very easy to clean. I like how it has 5 speeds for making foods like whipping cream for its so smooth and fluffy. It is very well made making it quite durable so it should last me for many years to come. Rated 5 out of 5 by DeLairV from love the extra items It comes with 2 helix beaters, 2 dough hooks, and 1 wire whisk. 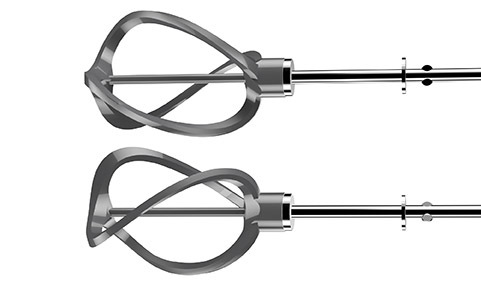 I love the dough hooks cause i use them to mix up my cookie batter and works excellent. I also like the helix beaters which don't splatter when you turn the speed up on the mixer. I like that it has all the extras so one can do more than just mix cakes with the mixer. Overall works great and doesn't splatter your mix as you turn up the speed and continue to use the mixer. Rated 5 out of 5 by Kelly04 from Easy to use This mixer works great. It isn't heavy so it makes it easy to hold and use. It mixes everything great. No more lumps in my mashed potatoes. The cord is long enough so you don't feel confined. It has several speeds to fit all of my needs. 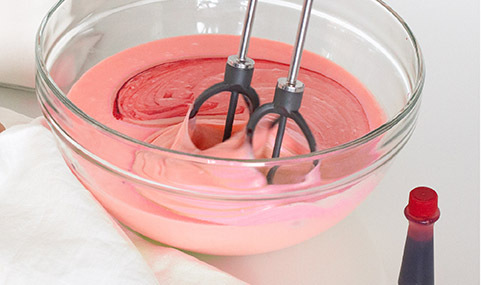 Rated 5 out of 5 by Becca86 from Absolutely love this hand mixer! This mixer is amazing, I was lucky enough to get it as a free trial! I definitely recommend it to everyone! It mixes simple recipes all the way to dough with ease! Rated 4 out of 5 by kelly07 from light weight, and works great! This seems to be an upgrade from other similar models because the beaters are a better shape and thicker than others I've used. I found that this mixer worked very well on potatoes and brownie mix. I don't think I'd used it for something thick, but for easy mixing this certainly does the job. The product is easy to use and will most likely be my go-to mixer in the future! Rated 5 out of 5 by Goldengirl2783 from I enjoyed using this mixer! This mixer is so nice. The attachments pop in and out so easily and I like the nylon beaters, they were so easy to clean. Mixed perfectly at all speeds. The handle is very comfortable to hold and a quick mix means my arms didnt get sore. My 5 year old love to help bake and he used it with ease as well. Rated 5 out of 5 by Priety from Five Stars !! It works great. Easy to use. I like the storage case it comes in and all the attachments. Great speeds that mix everything great. Does the job and does it well . Love it !! Rated 5 out of 5 by k2sgal1 from Mixing in Style!!! I love this mixer. I was still working with an old mixer so hooked this up and WOW I love the design of the beaters that is amazing. It came with 2 different types of beaters and a whisk which is great most just come with the 1 set of beaters. It also comes with a great storage case and the beaters fit inside so you always know where all your parts are >>> great. It also offers a turbo button to sped up the process. This is great so glad I was able to test out this product!!! Rated 5 out of 5 by Traci05 from A small mixer that doesn't realize it's small! I have used a small hand mixer in the past and it barely got the job done, I ended up hand mixing more often than not. Not with with this Black and Decker Hand Mixer! This thing is amazing!! I love that the beaters are covered and it really cuts down on the noise. My Husband was able to talk on the phone while I was using it! If you are thinking about getting this, do it, do it now!! Rated 5 out of 5 by MelissaInOhio from Best mixer ever! This mixer is amazing! The time it takes to mash potatoes is amazing! I have a large family so I have to make a lot of potatoes when we’re having mashed potatoes for dinner, usually it takes several minutes for my mixer that I had to get all of the potatoes mashed, however with this one it doesn’t. The speed and power of this mixer makes it a breeze and saves me half the time! Also I’m loving the compartment underneath for all of the attachments, I no longer have to worry about misplacing them! I would definitely recommend this mixer to anyone! Rated 5 out of 5 by mykidissmarterthanyou from Baking the old fashioned way! My son now calls this "baking the old fashioned way". Instead of using the large mixer where we do most of the work, he can easily use this to help us mix cookie/cake batter, etc. It was really simple to use and cleans well.No issues at all, thanks B&D for another awesome product!